sailboat. : Monthly Favourites: March. Although I'm sure I've started the majority of my monthly favourites posts off in this way I'm going to say it again. Where the heck did last month go and how is it April already? I'm sorry but I refuse to believe that it wasn't Christmas yesterday! I haven't achieved very much over the last month but I have fallen in love with quite a few make up products. 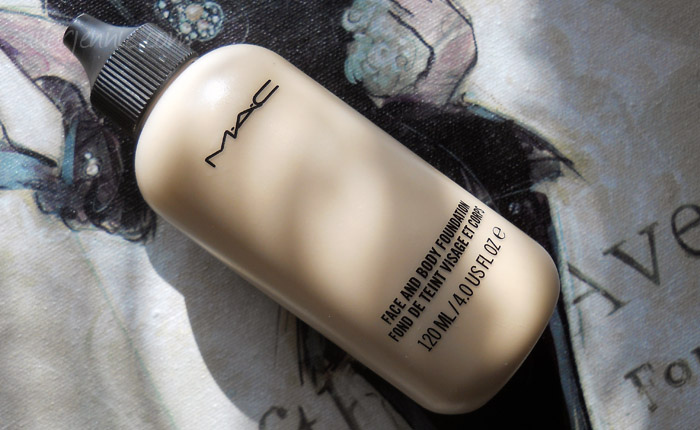 My foundation of choice this month has been the Face & Body from MAC, initially because I was curious to see if I would love it as much as lots of other people do and it didn't let me down. I think that it's a really beautiful foundation for my dry skin because it makes my skin look healthy, dewy & fresh without looking greasy. It is a light coverage but I find that it builds nicely to a light-medium finish which is perfect for a natural skin look. I'm all about natural skin at the moment & although I don't have perfect skin it's easy to pop a bit of extra concealer over any redness, scarring and blemishes I may have. Of course my skin doesn't look flawless but that's okay with me! As my skin has been so dry I've been relying on Oilatum Natural Repair Face Cream as talked about by Sam & Nic on the Pixiwoo YouTube channel. Now this isn't my favourite moisturiser, it can sometimes feel a little too oily on my skin, but I can't fault its ability to combat dry skin. I think I will always have a tube of this on hand just in case my skin has another super dry spell because it's a miracle worker! I still absolutely adore Neal's Yard Vitamin E & Avocado moisturiser and I'd really like to try Embryolisse Lait-Crème Concentré because it sounds beautiful. I found myself reaching for Douceur blush from NARS most days and although it doesn't look like anything special in the pan, it manages to brighten my complexion and make me look super healthy even when I'm not feeling my best. This is the kind of blush that will go with any look and I know that this is going to be a staple in my make up collection for a long time and I'll be reaching for it a lot during summer when I want to wear an obnoxiously bright lip! 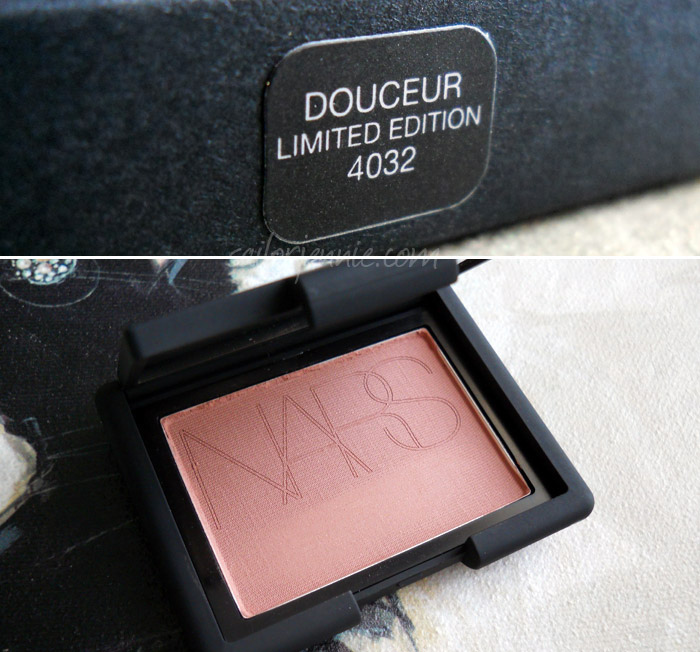 I'm also currently coveting NARS Madly blush because I think I'd love it for similar reasons! 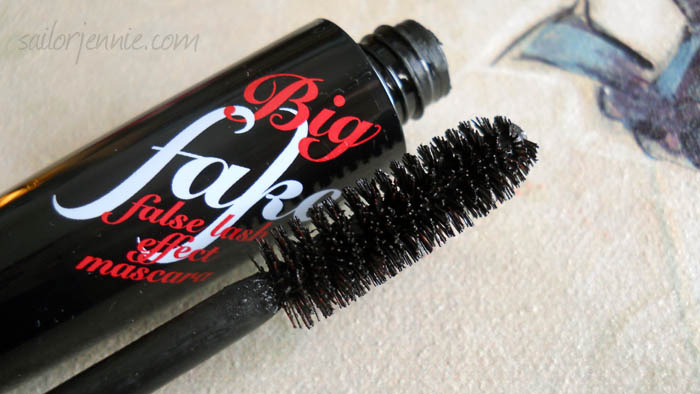 Collection 2000 Big Fake mascara is still my absolute favourite & I think this is my third tube. I really love the way this makes my lashes look, the fact it doesn't smudge and the price! It's so affordable. It does however dry out fairly quickly and when it is quite dry it can flake a little bit but I don't mind purchasing a new tube every 7 or 8 weeks because it's so inexpensive! The wand is pretty chunky so if you're not a fan of those then I'd steer clear of this because you do have to be careful when trying to coat those teeny lashes but I think it's worth the extra few minutes in the mornings! Lips wise Viva Glam Cyndi by MAC has been my favourite by far. I love the colour, it's a beautiful pinky-red & I love the finish. I'm so sad that this was limited edition and to be honest I still don't really understand why they make so many products limited edition, especially the ones where the proceeds go to charity. This would have been a constant repurchase for forever. I didn't have the pennies to buy lots before they were taken off the website and although they are still online on Debenhams I can't really afford to spend £13.50 on a lipstick at the moment. I'd love to know if anyone knows of any good dupes for that colour because it's perfect for wearing a red lip when you're scared of wearing a red lip. Does that make sense? The hint of pink tones it down a little I think. Maybe that sounds silly, I don't know. 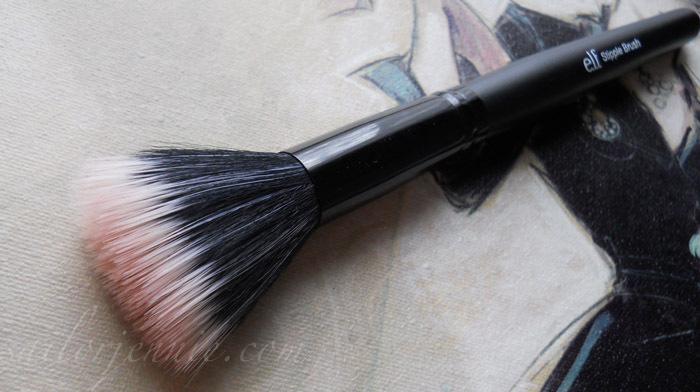 My Eyes Lips Face studio line Stipple Brush has been getting a lot of love and it works perfectly for applying blush. I think it's especially perfect with cream blush but I do like using it with powder blushers too. If you have any super pigmented blushers then this is exactly the kind of brush to apply it with because it seems to pick up the perfect amount of product and it blends it into your skin so effortlessly too. I love this brush & I think I may have to pick up a couple more at some point because they're only £3.50! Plus a blush addict can never have too many blush brushes! Fact. This was a bit of an impulse purchase after seeing Tanya from Pixi2Woo talk about it in one of her videos and it is The Body Shop Banana Shampoo. I think her description of this smelling like those foam banana sweeties prompted the purchase because they smell yummy and I wanted my hair to smell yummy too! I have quite oily hair and this is really lovely because it completely cleanses my hair without stripping it and leaving it feeling rough and looking dull. I have blonde hair that generally isn't very shiny but this shampoo gives my hair a little bit of life and I love that. The smell doesn't linger on my hair for very long which I'm a little bit sad about but I don't have the matching conditioner and I think that would help the scent stick around for a little longer. It's also a little bit pricey I think at £4 for 250ml, but the bottle seems to last a fair amount of time even though it looks so tiny so it's not terrible value for money at all. It does contain some not so nice ingredients so it's not a perfect product but I do like what it does to my hair. Finally I have discovered a nail polish that doesn't chip or peel off my nails. It's a miracle because every brand of nail polish I've ever tried before has peeled off on day one or chipped by the second day. Not even Barry M or Illamasqua polishes stay chip free on my nails even though they seem to on everyone else! It's not fair! I'd resigned myself to a nail polish free existence or a daily nail painting routine, (neither of those sound particularly nice! ), until I purchased Mint Candy Apple by Essie. Not only is the colour totally gorgeous & perfect for the spring time, this actually stays on my nails until I take it off. I hope all Essie polishes are like this because I'd love to have some other colours to play with too! Do you have any favourite Essie polishes? What were your favourites during the month of March? Let me know in the comments below because I'd love to know! Don't forget to let me know your favourite Essie polishes if you have one & also if you know of any Viva Glam Cyndi lipstick dupes! Love Oilatum too! Really want to try the Embryolisse as well, it looks to be a perfect base for make-up. I heard MAC's See Sheer is quite similar to Cyndi :) I had the same concern too! Great favourites love! You should try Double Base for a moisturiser. It's amazing and being an Eczema sufferer I rely on it! You can get it from most Pharmacy's! i have to agree with you, march went by crazy fast! i love nars blush, your color is really pretty! and that nail polish is beautiful! 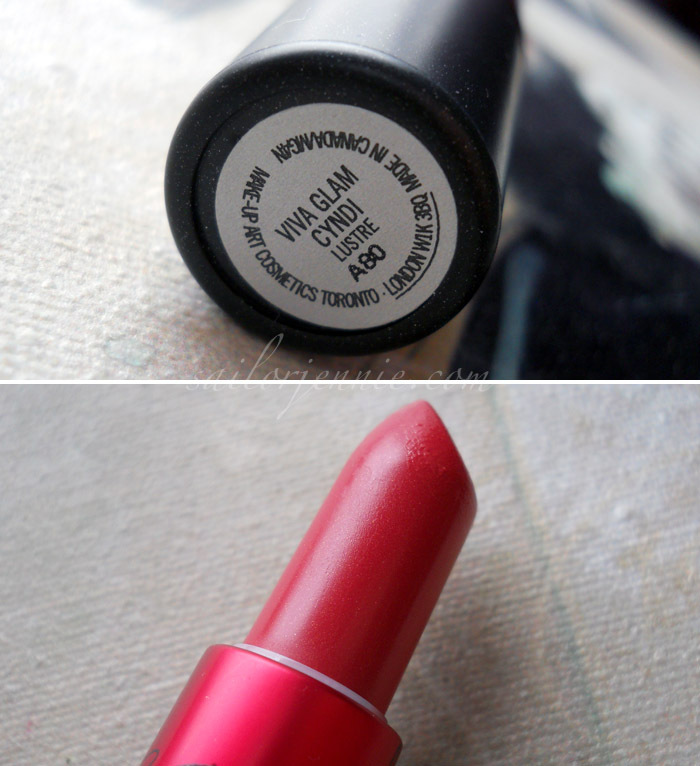 and the viva glam lipstick is one of my faves! @Sarah - It does, it's got some amazing reviews & a lot of people love it! @Yu - Ooh thank you for the recommendation! @cbsg5861 - I'll definitely have to give it a go, it sounds lovely! @Emily Anne - Ooh you've had some great favourites too! 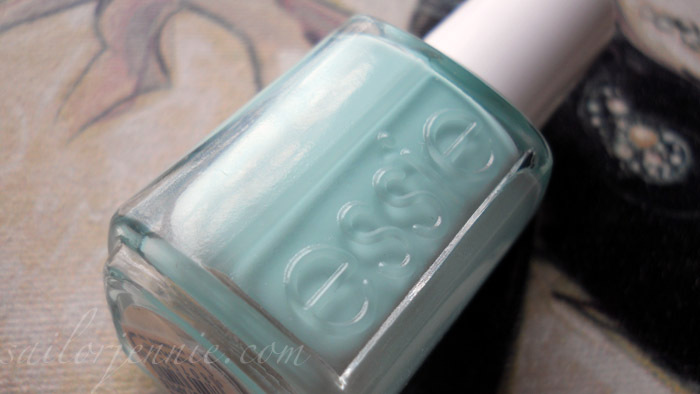 I just ordered essie's cute as a button today!! Will let you know when I do a review about it on my blog. The colour you have looks gorgeous! I've been loving the elf stipple brush for blushers too and like you said it's especially good for pigmented ones! But this month I've been loving the elf complexion brush as it's so soft and perfect for blushes/bronzers or mineral foundation! I have the Banana Conditioner but I don't recommend it!! It smells so nice but feels like nothing on my hair and the smell doesn't last long! I so need to try the MAC face and body- no idea what shade I'd be though! That Nars blush looks amazing. 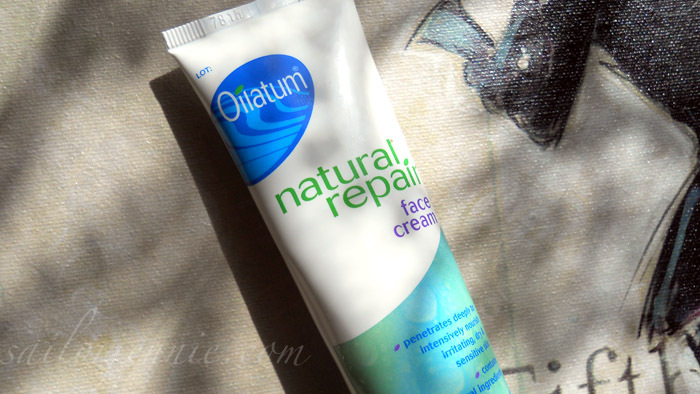 I must check out the Oilatum face cream for when my skin is at its most sensitive and irritated. I love alot of your favourites! It's funny,I have the banana conditioner but not the shampoo(lol), I love that stuff smells amazing. Love Essie Mint CandyApple - my fav, im actually wearing Revlon Minted which is similar too! Totally agree, Essie is one of the only ones I have found that doesnt chip. I really don't like Barry M, find them useless. Nails Inc and Models own are a bit better, but yes, loooove Essie! I feel the same about Cyndi! I don't really do red lipstick but that colour makes me feel like I'm wearing red hahah! Let me know if you find a good dupe! Love these posts! I want to try face and body but i think it's too light coverage for me :( really want that cyndi lipstick too :) xo. oooo have been wanting to try that banana shampoo for ages, bet it smells nicer than my body shop ginger one. Really need to check out the cyndi lipstick too, such a pretty colour. I'm right there with you on the mascara, Oilatum and Essie polish!! I need to try F&B - feeling the need for something a bit lighter with this gorgeous sunshine! 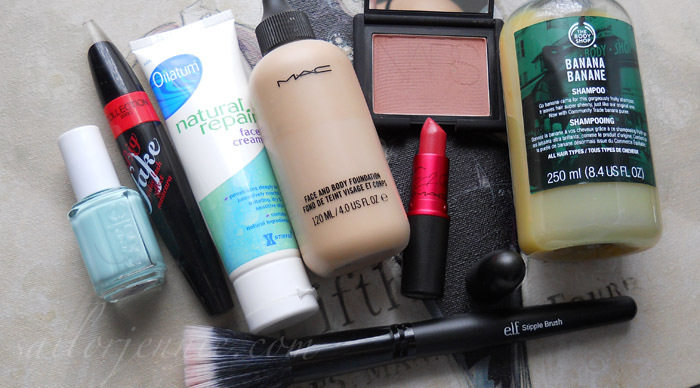 Love the round up of stuff here- Face and body is something I have sampled but never bought full size and I think it is next on the hit list (sorry bank account!) I adore the oilatum for dryness too- it sinks in like a dream over night huh! not sure how it will fare in Summer sweaty days but in Winter it has helped so much. I have still not tried that mascara, I totally forgot about some of the good things I have heard about it- after reeading this I think its going right in the basket. total bargain!